Ragtail Genghis Khan is a Blue Point Ragdoll. We got him from Angela Irvine at the Ragtail Cattery. He talks a lot but isn't loud with it. He loved to go outside on a harness and lead when he was little but then he got too big for it. Genghis just loves to carry his toys around in his mouth and often brings me something to throw for him. It took me a while to figure out why his water dish was spilling all the time until I caught him carrying it around. I have since changed it for a heavier ceramic one that he cannot pick up. If you have not heard of Ragdoll cats before then purr off to the Ragdoll Connection where you can find out all about them. At his first cat show (15 Feb 97) Genghis won First Prize overall kitten in show and has continued to do well as he won Best Desexed Persian/Semi-longhaired Cat of the Year 1997 with the Western Australian Feline Control Council. When he was around 8 months old he got frightened by childred squeeking balloons near his cage at a show and gradually over time he has shown that he has been most unhappy to to. We gave him a 7 month break but at his last show he was still not pleased about it so we will leave him at home now. We now have two new cats in the household. 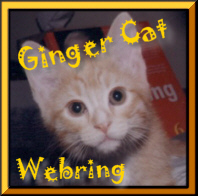 Dayglo is a ginger tabby (born January 2000) and the other is Ebony, Genghis' mum who has been retired from the cattery. 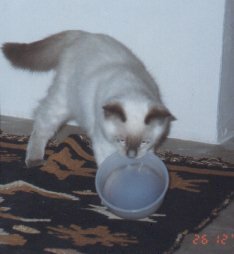 Majesticoon Big Biscuit is a Cream Point Birman and was born on 23 October 1996. He is a really energetic kitten and has taught laidback Genghis to climb on the kitchen bench. He has a sweet tooth and has a really loud yeowl for a meow. He loves cuddling up and will nibble me if not getting any attention but unfortunately for me bites fairly firmly and won't let go. He hasn't actually done major damage yet but.... Biscuit will howl for no apparent reason, maybe just to hear his own voice. You can hear him here. His favourite thing lately is to get on top of the back fence, just to give me a heart attack I think, as he hasn't escaped over it yet…. Cfa is a domestic long hair (Moggy), born about Xmas 1986, who now lives with her new human's in New Plymouth, New Zealand. We adopted Cfa when she was just 5 weeks old and she is the only one of our tribe that we actually chose. All the others were either strays that turned up on our doorstep or were given to us. Cfa has a delightfully friendly personality. 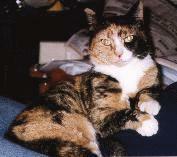 Cfa's new Dad told us recently (end March 98) that she rules the roost. Cfa loves to be brushed and combed as she is getting all the attention then. Just hold up the comb and she will come running. This photo of her standing up begging is a common pose of hers. Misty was the oldest of our tribe and was born 3rd February 1985. She was given to us by a friend when she was just 5 weeks old. When she was little she would run up the back of my jeans and then sit on my shoulder to see what I was doing. When she was fully grown she gave this up as she was too big. 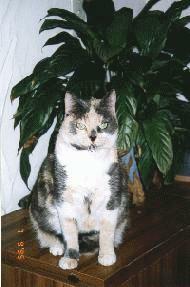 Misty was our "Mother" cat even though she never had kittens of her own. She mothered C4Cat and Fergie when they were small. Misty went to stay with an older couple in Inglewood, New Zealand when we left for Perth. Yes, you guessed it. 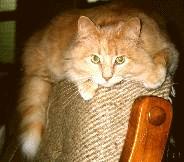 We named Fergie after Sarah because of the ginger in her fur. Fergie was the kitten of a stray near a friends place. The mother cat was not able to look after her kittens properly. Fergie was not well for a long while when she was small and we had to give her extra calcium to make up for not being fed right from her mother. She is a very long lean cat with a long tail so her nickname was "Long Lean Thin Thing". This cat was destined for greater things. She was dumped at the side of the road when she was a couple of months old and ended up at our place. Ian said that we were not going to have another cat (we had 5 already) so I suggested taking her to the SPCA. Ian wouldn't let me do that as it was nearing Xmas and there were so many kittens that most were being put to sleep. He said he would find a home for her. A month later she was still at our place so I took her to the vet for her jabs. "What is her name?". "Kitty", I replied. "She is not staying, you know". When she was 8 months old I entered her in the domestic section of the local cat show and she won Best Shorthair Domestic Kitten in show. She was allowed to stay officially then but we still called her Kitty. Boy, was this one skinny dirty looking cat when he first turned up at our place trying to steal our cat's food. He was so scared of people it was several weeks before I could get him to eat dinner outside with me in sight. I couldn't even tell what colour he was. All I knew was that he had long knotted fur. Eventually he started to eat inside and I was able to cut off all the painful knotted fur. He was a full tomcat so would only eat at our place every 2-3 days in his travels. Time passed and he got used to us. His fur grew back and we found that we had a beautiful Silver Tabby. Fitzpatrick was adopted by a family with children when we left New Zealand and they let us know that he was doing well and loved to follow the kids to school. There is a good reason why she was called Nosey. It is because she is very nosey. She would get into all sorts of scrapes. Mostly chased there by Squeek I think as they didn't get along. The first week or so that Nosey lived with us were very traumatic. She wouldn't eat anything! Well, not catfood at any rate. People food was OK. She got so skinny I thought she was going to die. The vet said to feed her on anything she would eat. So mince warmed in the microwave became her diet. A few months later we changed all the other cats onto Iam's dried catfood and much to our relief Nosey would eat it too. There were still times when she would refuse anything that was not obvious people food but in the main things were fine. So named by his family because he never meowed. Just squeeked! Yes this cat was not even ours, he belonged next door!! He made himself at home at our place when he was about 3 months old. Much more fun at out place than at home by himself so he would come over to play. Mind you none of our cats really wanted to play. He was just a bit younger than Kitty and she would play with him but when he was full grown she changed her mind as he was too rough. Squeek would chase Nosey all the time too which is why she would hide out across the stream somewhere and only come inside when she knew that there was a human there to protect her. I guess lots of black and white cats have been called Sylvester over the years and our friend Raywin named this one. Sylvester was one of C4Cat's kittens. I always said that we didn't need another cat in the house (we had Misty and Cfa at the time I think) but Ian kept telling the kitten to see me about it. 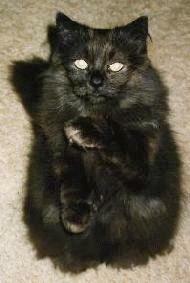 That kitten was always the first on the bed and the first on my lap. He ended up staying. Unfortunately when he was about 6 years old he suddenly got sick one day and when I took him to the vet it was already too late, he was too ill and had to be put down. A very sad day for us. The vet did an autopsy and found it was an ulcer which would have been very hard to diagnose even if I had noticed something amiss sooner. I was told that mostly cats either get better from ulcers or not. Sylvester was one who didn't. I guess if I had noticed he was a bit poorly, the vet might have given him antibiotics which may have helped the ulcer but might not have either. We still miss him though. 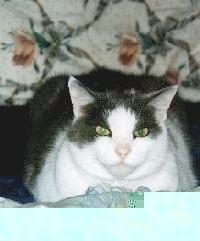 Pat Shaw has lots of cat things on her page called Pat's Cat Links . I especially love the cat gallery link there. The local cat club I belong to (I'm the newsletter editor) is The Bare & the Beautiful Cat Club.